From Kunawarritji west the sandhills closed in. There was just desert now, no hills or jump ups to break the scenery. 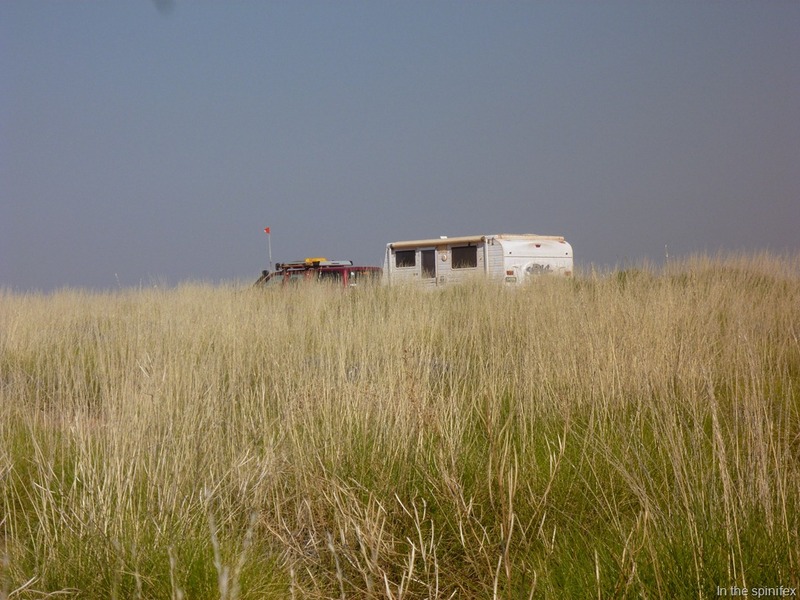 Just spinifex and very low scrub. It is also getting hotter. We are on the Wapet Track now which will take us via Punmu to the Telfer Mine Road. Half way between Kunawarritji and Punmu is Lake Auld. Don’t get visions of a beautiful blue shimmering lake however as this is the desert. It certainly shimmers but that is from the heat. 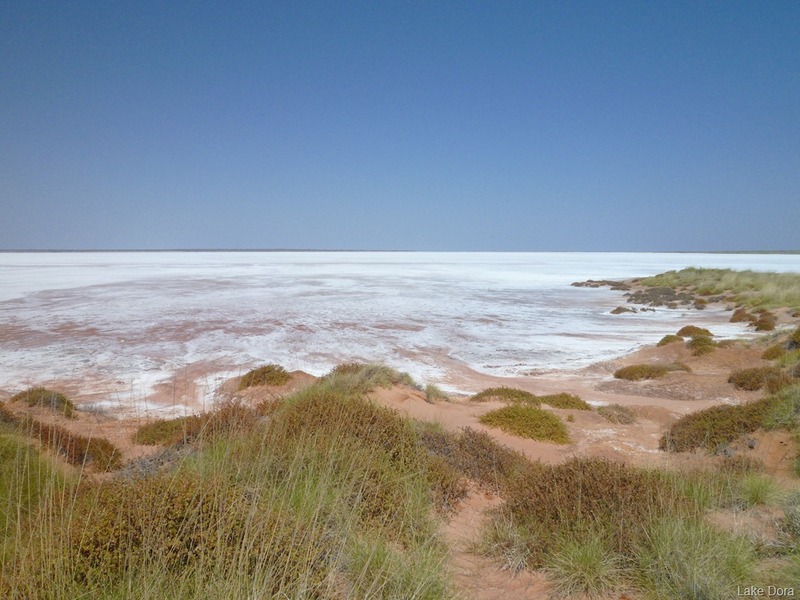 No water in Lake Auld, just a salt residue. I walked out onto the lake until it got too spongy. Even the camel foot prints stopped at the lake edge. West of Lake Auld the sandhills closed in until they were only about 100 metres apart. Punmu is beside Lake Dora, another lake that very rarely sees water in it. Leaving Punmu it was necessary to cross several big sandhills. These had been topped with clay so that was not a problem. In fact much of the road had been topped with clay which makes a good surface. The only issue being that it gives off a very fine white dust as you drive over it, a bit like talcum powder, and this is even worse than bull dust for getting in everything. Every so often there is a forty four gallon drum beside the track with an arrow for direction and a distance (normally one to five kilometres) indicating the nearest water source to the track. These seem to occur every ten to twenty kilometres. As it is about 40C in the sun now in August. I would hate to think what it must get to in summer! Break down here without water and there is a good possibility you would not survive. At one of these water sources, a bore on the track Vicki stuck her head under the outlet pipe to cool off. Around 50 kilometres west of Punmu the country started to change again. Sandhills were replaced by hills and rocky outcrops. Whilst driving across the top of one of these low lying rocky ridges Vicki’s phone received an SMS, the first 3G connection we had since leaving Alice Springs. Plugging the high gain antenna into the laptop I found I had three bars and excellent speed on the Internet, better than Orford. 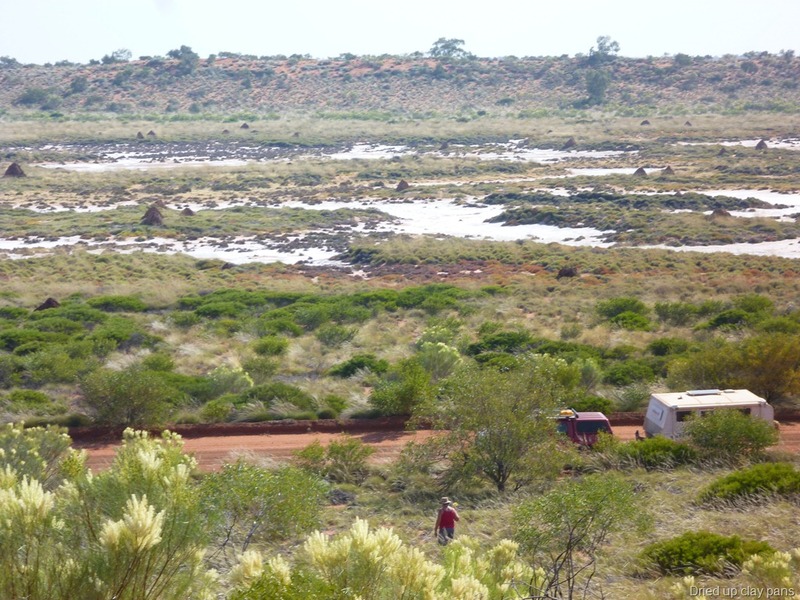 Looking around there was no habitation or evidence of human presence for the full 360 degrees but I assumed we were receiving a signal from the Telfer Gold Mine which was about 50 kilometres further west. So I managed to publish the three blogs I had written whilst traversing the desert. We then headed further west until we turned onto the Telfer Mine Road. At once civilisation returned with more traffic in five minutes than we had seen in the previous six days. About 40 kilometres along this road we pulled into a lay by for the night. No sooner had we pulled in than four road trains with escorts came through carrying large mining machinery. Luckily the dust was blowing the other way. We had come 1,500 kilometres through the desert on a fantastically interesting trip. Luckily the tracks had been good as they had been graded twice this year because of extra flood damage money that had been received. We have been told by several track users that if not for this extra grading the tracks would have been in poor condition. Because the track was in such good condition it was easy to get lulled into a false sense of security and then all of a sudden right in front would be a wash away or a bulldust hole. Of course the normal corrugations still existed at bends and other usual places. We saw very few vehicles on the tracks, a supply truck, two exploration drillers and two vehicles travelling between communities were the total of the vehicles we met. We saw no other travellers. Camping was not a problem as there were any number of places to camp. We find microwave repeater towers great spots to camp. 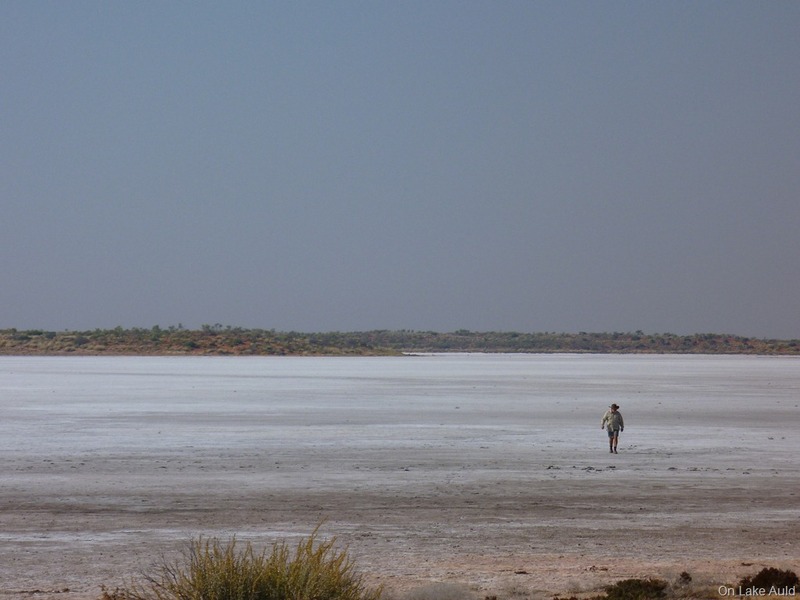 HEMA’s Great Desert Tracks maps that we used are fanciful about the facilities at these remote communities. They show all sorts of things from caravan parks to camping to accommodation to meals being available when in fact these do not exist. There are meals, if you arrive when the general store is open, and settle for a Mrs Mac’s pie! Our fridge is not coping with the heat very well. These three way absorption fridges are not nearly as efficient as the compressor type fridge in really hot weather. During the day the fridge is around 10C to 12C. It just cannot handle the high ambient temperature. Its on notice “shape up or ship out”. 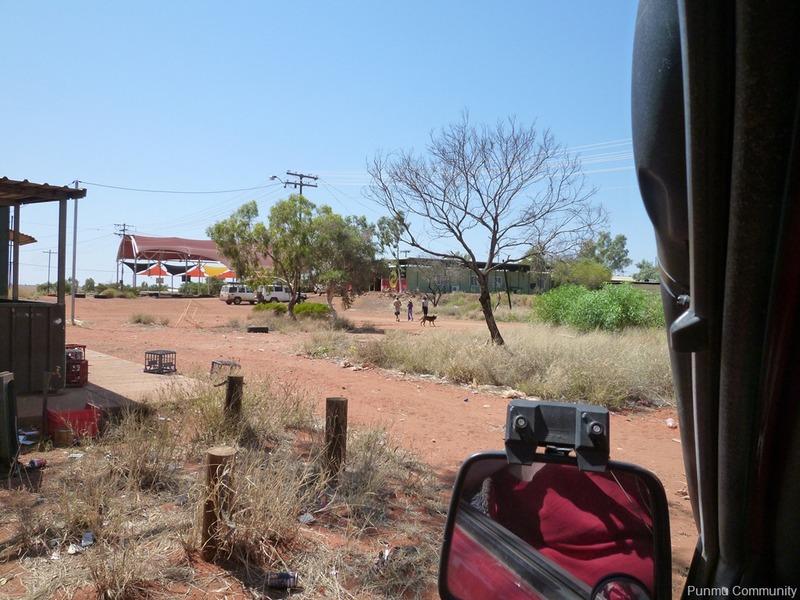 We made two changes to our equipment in preparation for this trip before leaving Alice Springs. I replaced the Hyland coupling on the van with a Tregg hitch. The Hyland was fitted to the van by Goldstream (the van manufacturer) but was not proving suitable. There was a distinct “clunk” coming from the coupling when on corrugations because of the play in the coupling. The Tregg hitch is slightly more difficult to use in coupling the van to car but is rock solid once coupled and a vast improvement. We also purchased a tyre monitor that shows the pressure and temperature of all six tyres. This enabled us to constantly know the pressure in each tyre and therefore removed a lot of worry about damaging a tyre because of driving too far when we had a puncture. I couldn’t sleep this morning as we are still trying to adjust to WA time again so at 4:30 I decided to get up and write this blog. 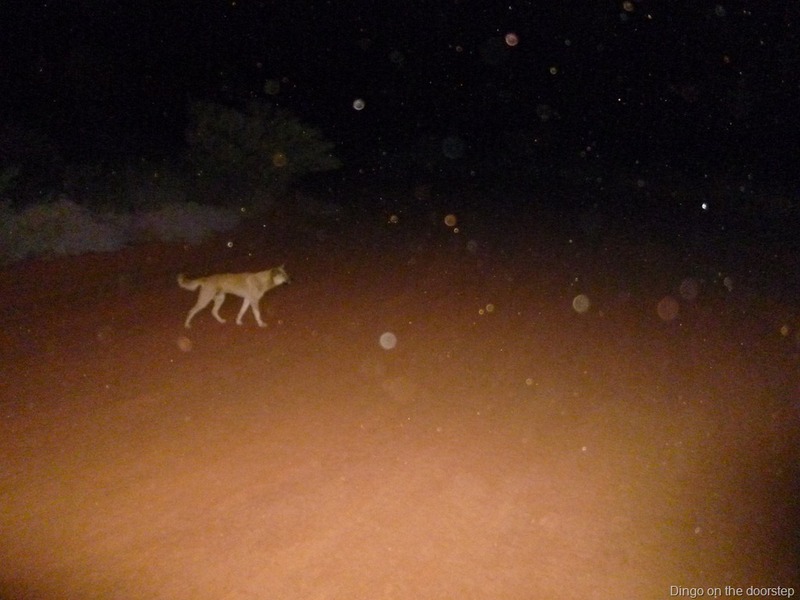 Opened the caravan door to find a dingo about three metres from the door. I went to the car to get the camera and he just stayed watching. He hung around until sunrise then headed off into the bush. After he left we realised he had taken our door mat about 50 metres away and chewed a couple of pieces out of it. 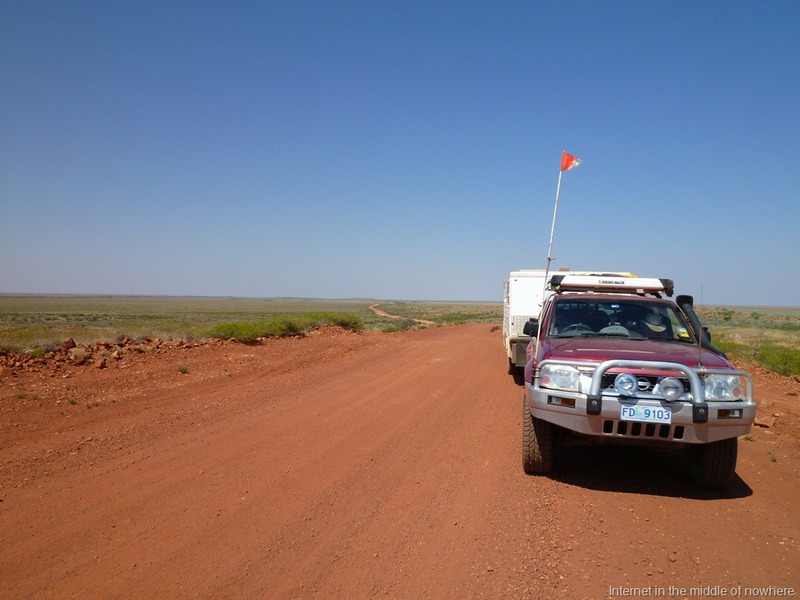 We now have only another 100 kilometres on dirt before we meet the bitumen. The best thing is that there are still thousands of kilometres of Len Beadell’s tracks in the desert left to explore! 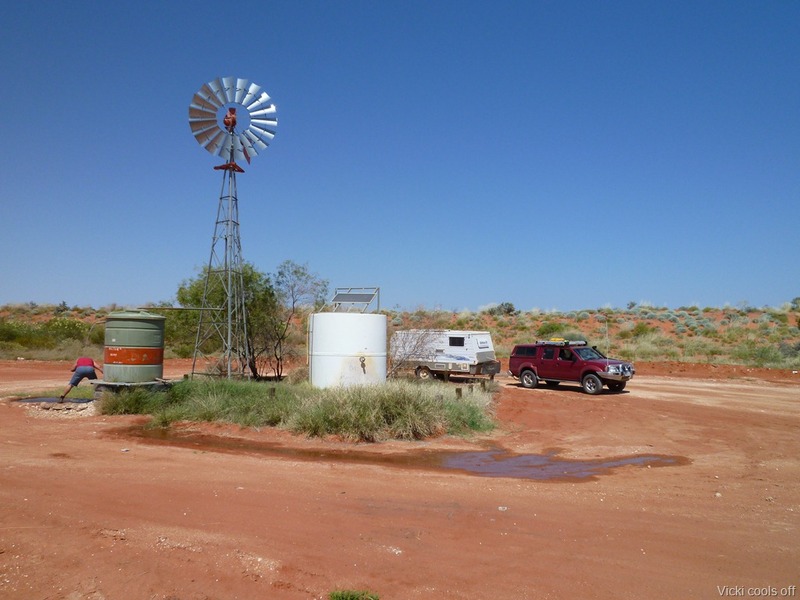 This entry was posted in On the wallaby and tagged Goldstream explorer, Lake Dora, off road caravan, outback travel, Travel journal. Bookmark the permalink.